Dn. Savvas Takayi, his wife, and two children. Though Orthodoxy has had a presence in Zimbabwe since the early 20th century, for decades the Church was limited to serving Orthodox expatriates from Greece and elsewhere. In 1993, a young Zimbabwean named Raphael received a scholarship to study in Greece for an army officer’s training course. While he was in Greece, he was introduced to Orthodoxy. In August 2002, he was ordained to the holy priesthood and became the first Orthodox priest from Zimbabwe. Fr. 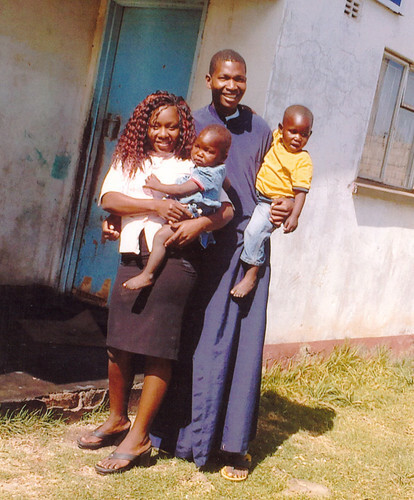 Raphael fell asleep in the Lord in 2012, but the sharing of the Gospel in Zimbabwe continues through other mission priests who have followed in Fr. Raphel’s footsteps. Today, the Archdiocese of Zimbabwe is overseen by His Eminence Metropolitan Seraphim and includes seven clergymen, two of whom are sponsored through the OCMC’s Support A Mission Priest (SAMP) program. One of these is Dn. Savvas Takayi. He was born in the rural area of Domboshava in 1988 as the oldest of seven children. At the age of sixteen, a friend invited him to the Orthodox cathedral in Harare, and he was moved to become Orthodox. In 2007, he was sent to study theology at the Patriarchate in Alexandria, Egypt. He was ordained to the diaconate in 2011. He currently serves the Mother of God parish in Warren Park. Mission priests, like Dn. Savvas, are crucial for reaching the millions of people who do not yet know Christ. Around the world, mission priests serve to bring the Gospel's message to all nations. You can share in the ministry of these mission priests through OCMC’s SAMP program. Please keep our mission priests in your prayers!